MUSIC TYPE A fusion of folk, blues and Middle Eastern styles. Sydney singer/songwriter Jesse Younan has just arrived on the acoustic scene, but his skill and appeal have already won him a loyal following. Jesse’s music defies boundaries. 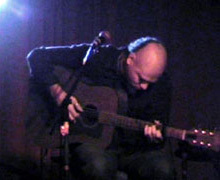 The intensity of his style invites comparison to such artists as Paul Kelly and Jeff Buckley, yet Jesse’s compositions are unique and distinct. He fuses folk, blues and Middle Eastern styles to create a sound in a genre of its own. Jesse’s combination of haunting vocals and hypnotic guitar playing affects even the most diverse of audiences. His passionate performances reveal a gift for capturing the machinations of the human heart in song.